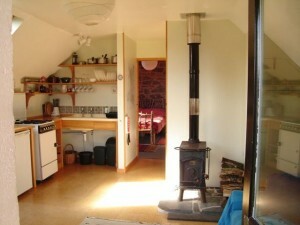 Inside, the living room is bright with natural light, and is soon made cosy by the PARP wood burning stove. The sofa is easily converted into comfortable extra sleeping space for two. There is another comfy chair, and a table and chairs for dining – or writing or drawing or playing games. 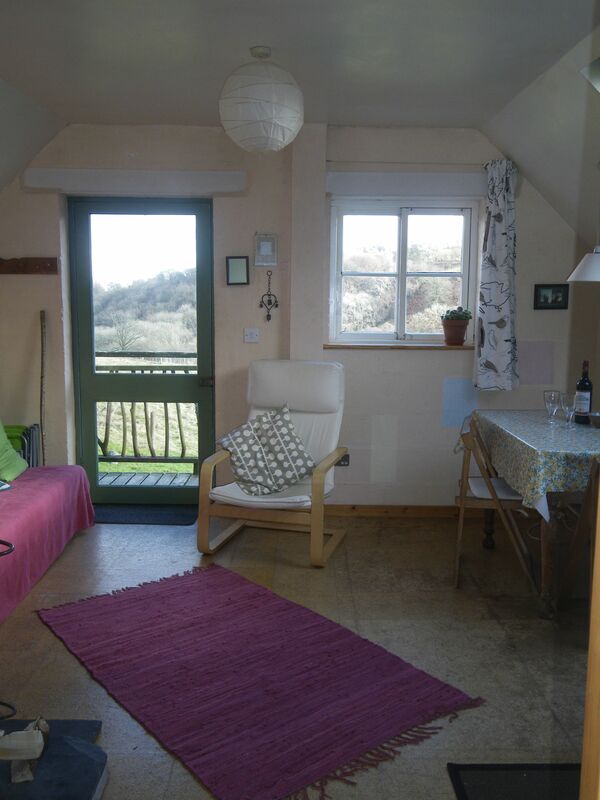 The kitchen area includes units made from locally-sourced oak and beech, a single-drainer enamel sink, gas cooker, fridge (with ice compartment), electric kettle and toaster, an adequate number of saucepans etc. and good sharp knives. There are crockery and cutlery, tumblers, wineglasses and eggcups etc. sufficient for four, two teapots and a cafetiere, and recycling and composting facilities. 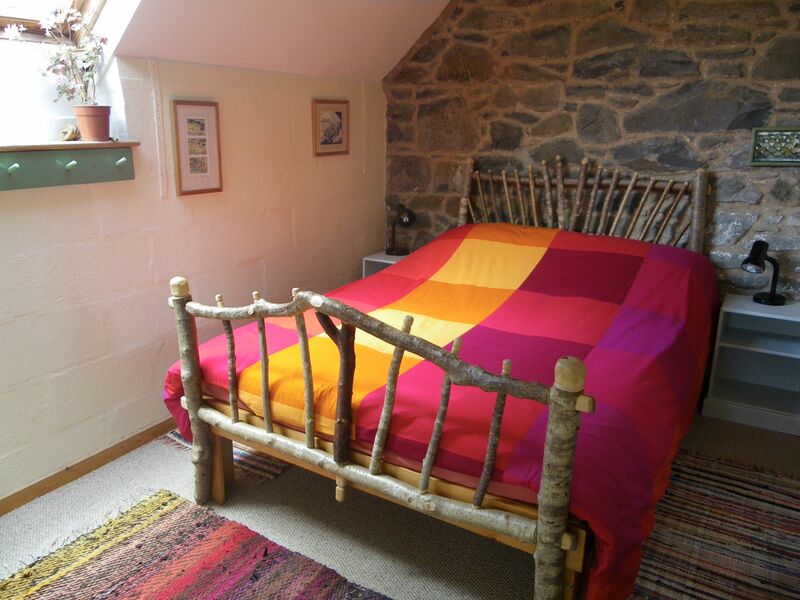 The beautifully rustic bedhead is made of hazel and rowan greenwood from nearby hedgerows. The carpeted bedroom has a comfortable double bed with king size duvet, extra blankets, and a firm high-density-foam mattress; the beautifully rustic bedhead is made of hazel and rowan greenwood from nearby hedgerows. There is plenty of clothes hanging space, shelves, and a small table and chair. It is possible for two small children to have beds on the floor. The bathroom, also bright with natural light, has a hand basin, bath and WC. The Hideaway has been described as ‘all you need and nothing you don’t’. Wood, eco-friendly paint, and other natural materials have been used throughout the Hideaway. The emphasis is on uncluttered space, helping you to feel that you have really ‘got away from it all’. The Hideaway has been described as ‘All you need and Nothing you don’t’. We are happy to be asked if we can provide or enable the use of anything else you need – for example particular cooking equipment or the use of a washing machine. Pictures, plants and books help to create a homely feel; there are maps and guides to borrow, and a few games, including Scrabble. There is no television but there is a small Roberts radio, and excellent WiFi and mobile phone reception. 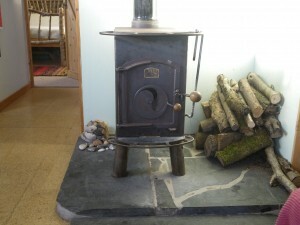 The PARP woodburner is keen to keep you warm. The PARP wood burner is keen to keep you warm; before you know it you could be too warm! The bedroom and bathroom will also benefit if their doors are open, but for those who want some background heat in addition, and for colder weather, there is an oil-filled electric radiator in each room, and a wall heater in the bathroom. This is by electric immersion heater, the timer of which you can set as you wish. On bright days the sun will contribute via solar hot water panels.